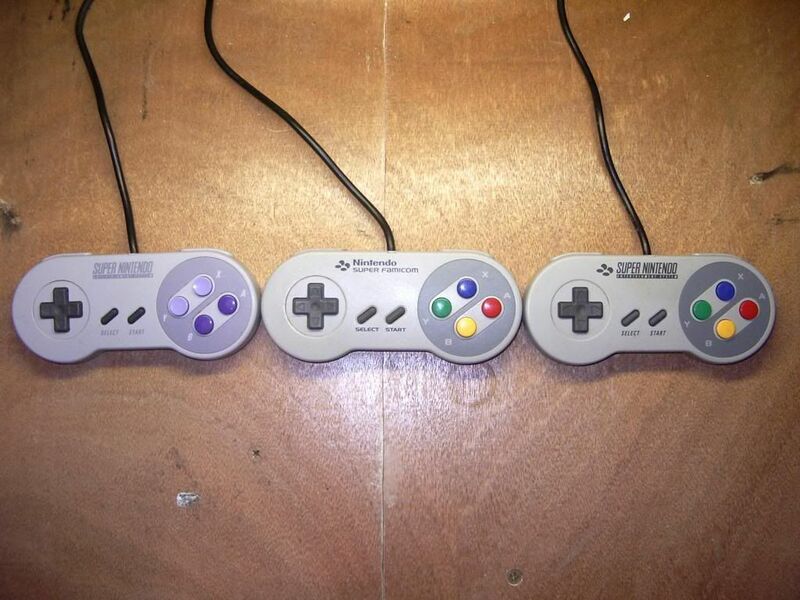 This page is a guide as to which snes controllers will work on which systems, and how to modify the consoles and/or controllers so they will work with the hardware they were not designed for. The original GameSX version of the pal console modification guide can be found Here. As the following table shows, the only compatibility problems you will have with the snes controllers will be making the US and Japanese controllers work on the regular PAL SNES. There are two options you have to overcome this, firstly, modifying the controller, and secondly, modifying the console. You will only need to perform One of these. * The US and Japanese SNES and SNESJr pads are functionally identical. 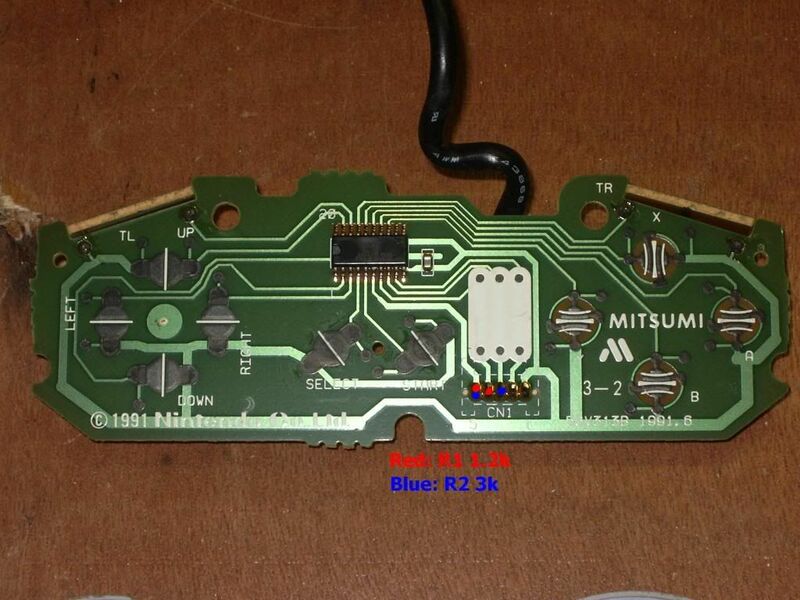 Modifying the controller to work on a PAL SNES is fairly simple, basically you have to put in the two 'only-P' resistors, R1 and R2. 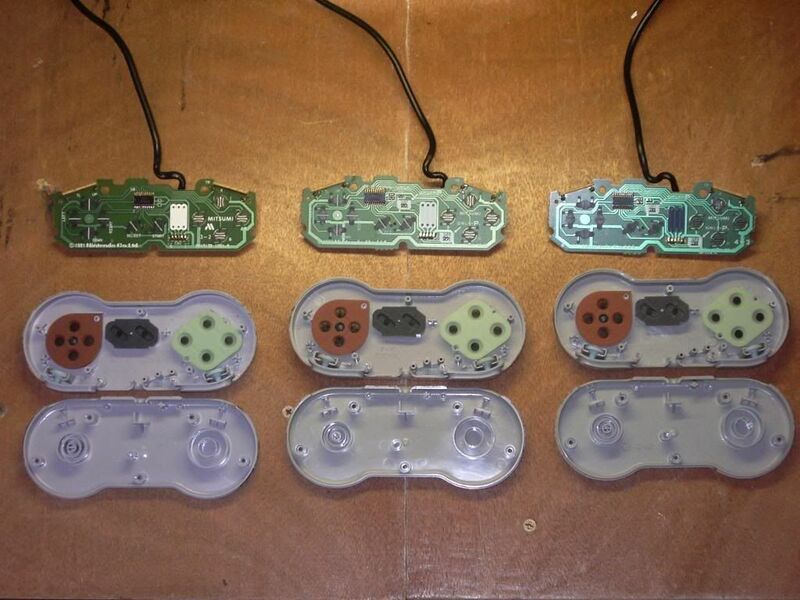 As the PAL controllers work on all of the consoles, the resistors will effectively make the controller universal. There are two (at least) revisions of the SNES controller PCB, if you look at the pictures under 'Visual Aids', the US SNES controller has one, and the Super Famicom has the other. 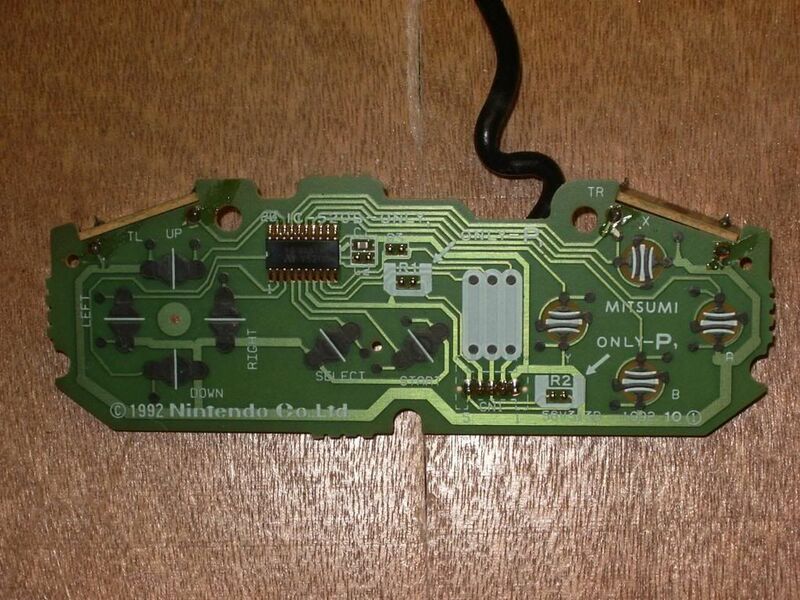 (you may find a US con with a PCB like the Super Famicom controller pictured here, and vise versa). If your controller has places for R1 and R2, all you need to do is solder a resistor between the two solder pads in each place, a 1.2k resistor at R1 and a 3k resistor at R2. the resistors that are meant to go there are very small physically (surface mount), but without the proper tools it is difficult to solder these if you can even buy them. any resistor will do the job so long as it has the correct value, 1/8 watt resistors might be better as they are smaller physically, but a regular 1/4 or 1/2 watt resistor will do fine if it fits and doesnt interfere with the buttons at all. For the other revision, you will need the same two resistors, but because the PCB lacks places for the 'only-P' resistors, you will have to solder to other points on the pcb. The following picture shows where the resistors should be soldered on these PCB revisions, the 1.2k resistor should be soldered between the two red points, and the 3k resistor soldered between the two blue points. 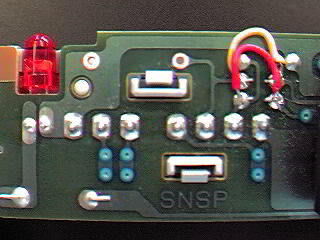 If you find it too difficult to solder the resistors directly to these points, you may run wires from them and put the resistors anywhere you like inside the controller, so long as they are fixed down with something like electrical tape or hot glue, and will not move about. The information for this mod came from the fantastic and sadly long gone British mag, SuperPlay. 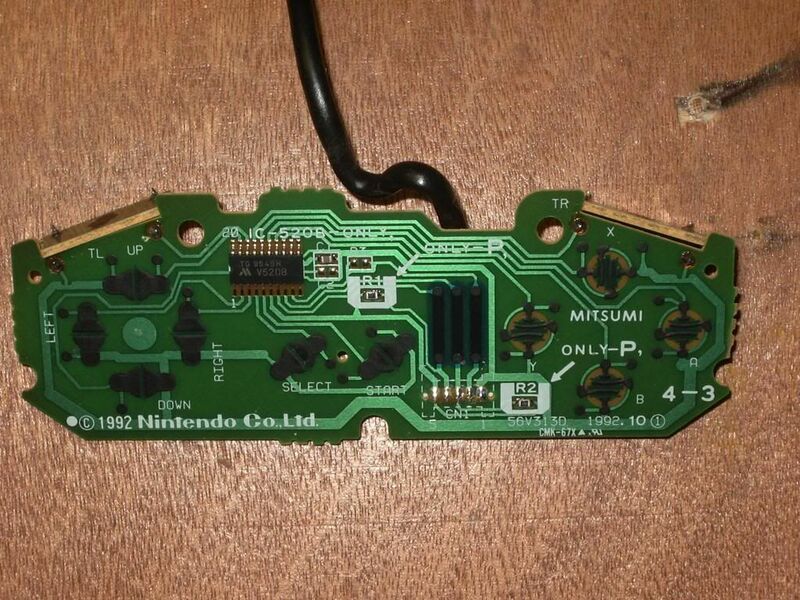 What you see below is the controller sub-PCB from a PAL Super Nintendo. 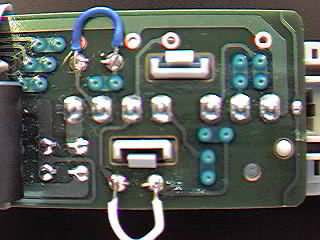 The four wires are bypassing, or shorting, diodes (not shown) that prevent NTSC pads from working on the PAL console. There's no reason for this except Nintendo UK being greedy, as they're wont to do. Adding these four wires will not affect your PAL console in any way. It will still continue to work with all PAL and NTSC pads. Lawrence says: My apologies for the unclear image. I have no excuse. Note the unused solder pads for resistors R1 and R2 (Also highlighted in white, and labled 'only-P', meaning 'only PAL'). Note the resistors at R1 and R2 (only-P positions). R2 is a 3k Resistor (labled '302').